A Christmas Carol is not the only thing playing in that big beautiful blue building on the river. Across the lobby from the 44th annual production of A Christmas Carol, the Guthrie is presenting a hilarious comedy that will make your face hurt from laughing so much. 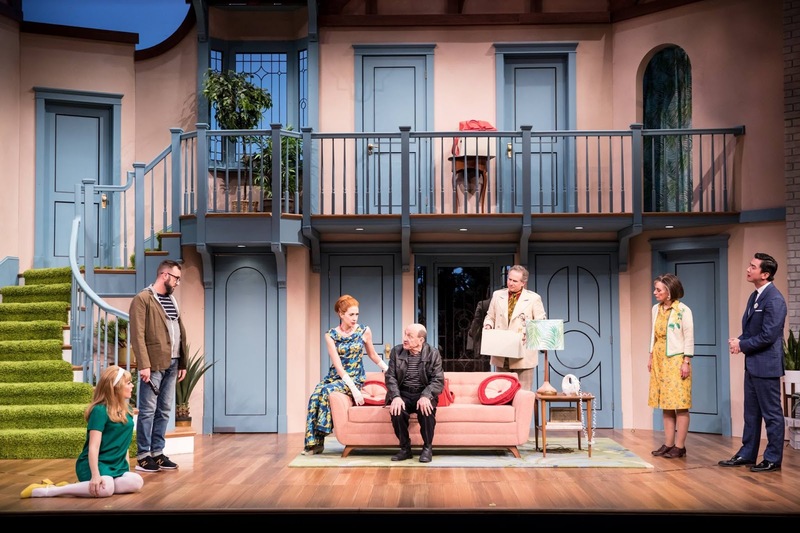 Noises Off is the perfect madcap comedy, perfectly executed by the cast, crew, and creative team at the Guthrie. 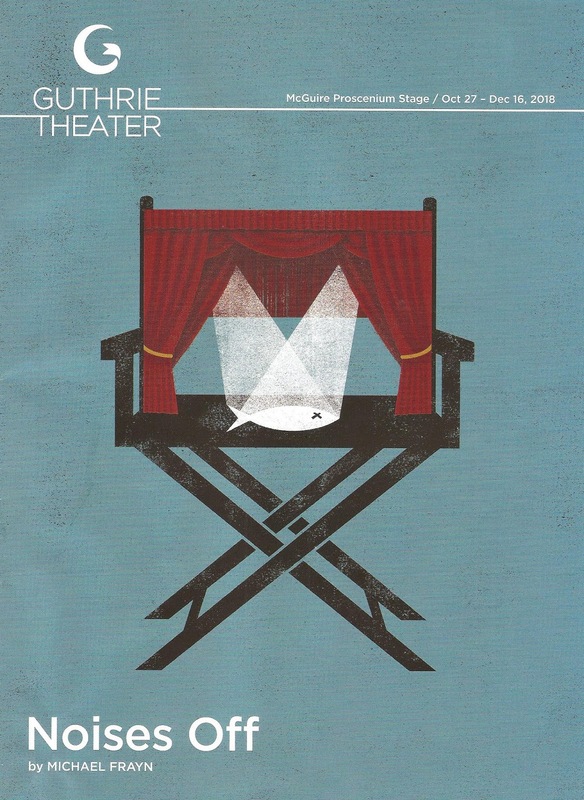 The play within a play format allows the audience to peak inside the world of the theater and see what it might be like in rehearsal, backstage during a performance, and at the end of a long and troubled tour. It's a complete mess as things continue to go wrong for the fictional company, but the real-life company pulls it all off beautifully; this is impeccably organized chaos thanks to first-time Guthrie director Meredith McDonough and her team. If your thoughts about theater are, as one of the characters in the play says: "I don't go to the theater to listen to other people's problems, I go to be taken out of myself and hopefully not put back in again," this is the perfect play for that. This cast, a mix of local and national talent, is sheer perfection, and each one of them is a joy to watch. As the frazzled director Lloyd, Nathan Keepers gets to display his gift for physical comedy, but perhaps the best part of his performance is the way he embodies Lloyd's struggles to keep a calm demeanor despite his extreme exasperation at the incompetencies of the cast, until he finally breaks. Kimberly Chatterjee is adorable as the put-upon stagehand Poppy, and up-and-coming local actor JuCoby Johnson makes the most of the least stage time as another stagehand, particularly in his awkward audience announcements. Johnny Wu is a charmer as the somewhat clueless actor who plays the lead; I particularly love the way he slips in and out of his character's accent vs. his character's character's more posh accent (get that?). As opposed to the delightful Kate Loprest, whose character, the ditsy blond Brooke, is almost exactly like the character she plays - mostly vacant. Laura Jordan is everything you could want in the mother hen who knows everybody's business, and Remy Auberjonois is lovely as the delicate actor who suffers from nose bleeds and needs to know his character's motivation for everything. Last but definitely not least are a couple of beloved #TCTheater vets - Sally Wingert as the veteran actor Dotty whose career and finances hang on this tour, and Raye Birk as the alcoholic and not quite all there Selsdon, who plays a burglar. The only problem with this cast is that they all make wonderful character choices at every moment, so it's impossible to catch everything in one viewing. The Act II silent backstage comedy is a particularly brilliant ensemble dance (with fight direction by Aaron Preusse and movement direction by Nathan Keepers). 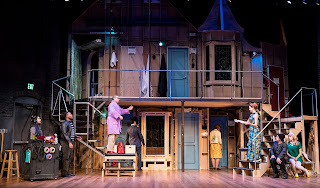 The onstage/backstage set is an important character in the play, and scenic designer Kate Sutton-Johnson has created a masterpiece. 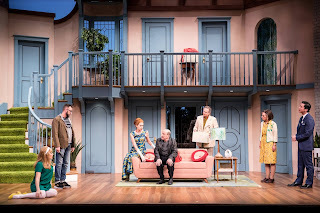 The onstage set is bright and colorful with no less than eight doors (because in farce, more doors = more funny), and when the curtain rises on Act II we get to watch the set rotate around to show us the same thing from backstage, a delightful revelation. Backstage is particularly detailed with all the equipment and props needed, and each entrance to the stage labeled "bathroom" or "study" or "front door." It's like peaking into a real theater backstage. 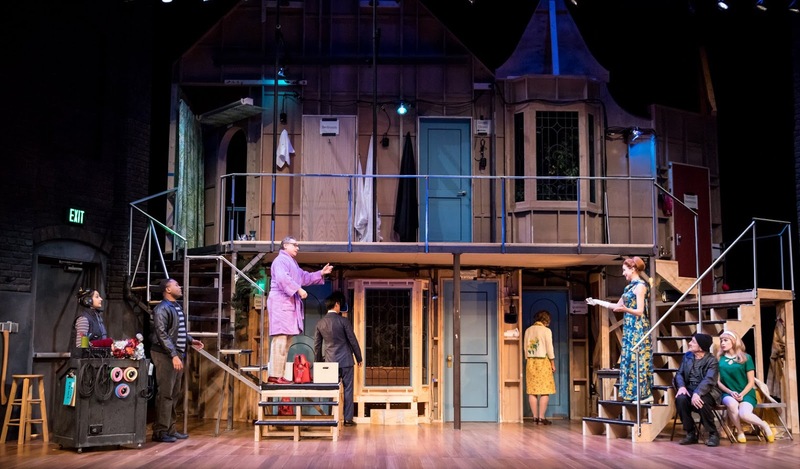 Meanwhile, costume designer Sara Ryung Clement has clothed the play-with-a-play characters in colorful '70s garb to match the set, while the offstage wardrobe is subtly modern, like this could be happening now, or at any time. But not anywhere; all of the characters speak in delightfully varied British accents (aided by resident voice coach Jill Walmsley Zager), which just makes everything funner. If you love theater (and if you don't, why are you reading this blog? 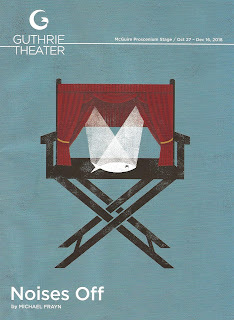 ), you'll love this farcical (but maybe a little bit true) look at the inner workings of the theater. It's extremely well-done theater about very poorly done theater. Continuing through December 16. *Plot summary borrowed from what I wrote about the production at Artistry earlier this year.